So you’ve decided to change your unhealthy ways. You got yourself a shiny new gym membership and swore you’re going to lose those love handles and gain some muscle this time. Do you find yourself lost and confused when you get to the gym or just unsure on where to begin with your workout? If this sounds like you, you’re in luck! We’ve developed a list to help you maximise your workout and boost your confidence. The hardest part about any workout is the act of actually starting it- It’s true what they say, “convincing yourself to start is half the battle”. A positive mindset and visualising what you plan to do throughout your workout goes a long way. Harnessing this positive mindset will not only help you achieve your goals, but will also help you attain motivation. Remember to keep your goals and expectations realistic. A proper warm-up should be a part of every healthy workout routine. A warm-up will ensure your muscles are nice and ready for the task ahead and help to elevate your heart rate- making them less injury prone. A simple 5-minute jog and 2-minute stretch is all it takes and you’re on your way! This should be taken seriously, as most injuries at the gym can easily be avoided by a simple warm-up. Performing the exact same routine day after day will likely lead you to a plateau (a stage where your progress seems to have stopped completely). One easy method to avoid this potential motivation killer is by keeping a workout journal. A workout journal should be used to record all exercises, sets, reps, and the amount of weight used during each training session. You should use these notes to create new workout routines that are more challenging and demanding. This will not only motivate you, but will allow you to customize your workout better. 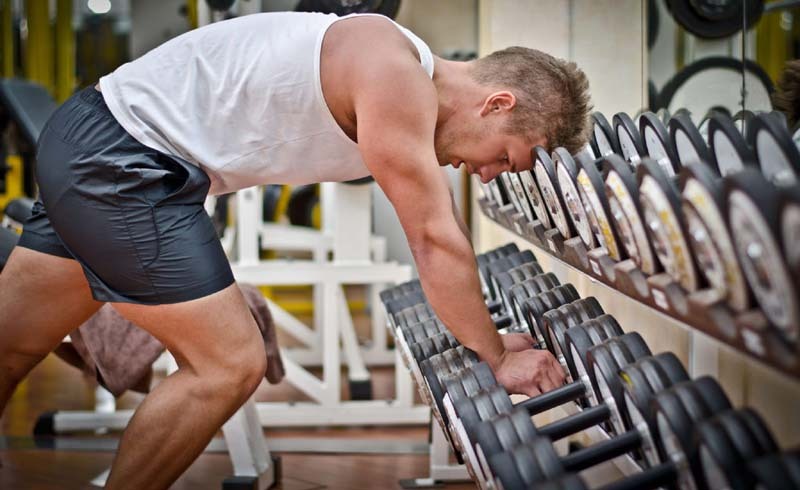 Often people stay with machines weights for strength training because they’re not confident enough to use free weights like barbells, dumb- bells and kettlebells. Like with everything at the gym, machine weights have their place, especially for beginners and people with injuries. The main concern with machine weights is they don’t involve movements you do in real life, like twisting and bending. Free weights add variety and offer properly simulated real life movements- a more natural workout method. Don’t fear free weights, just make sure you learn the proper techniques to use them. Ever heard a song that pumped you up so much you felt like you could do anything? 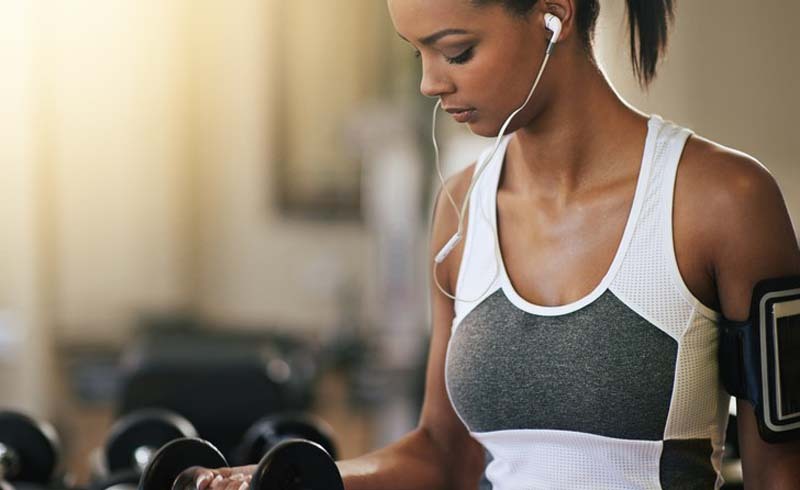 Listening to music during your workout can result in both an uplifted mood and better endurance. Numerous research has been done on this phenomenon and it’s said that the act of listening to music releases endorphins in the brain, which help with motivation and focus. So plug in those headphones and crank up your Britney Spears, Skrillex or whatever floats your boat and hit the treadmill or weights room. In our ever connected “mobile era” it’s easy to lose one’s train of thought. Text messages, Facebook and games are all motivation killers during a workout. Using your mobile phone during sets and rests can lead to unwanted procrastination, which will hinder your workout and its effectiveness in the short and long term. Try your best to avoid all mobile phone interaction for the duration of your workout. That text from Emily about drinks on Friday night can wait. Sometimes we have the perfect workout day- things are going to plan, and you’re meeting all your workout goals for the day- other days may not be as productive. If your workout involves weight lifting and you feel that you want that extra edge to get the most out of your workout, there are heaps of legal and healthy supplement intakes that can help you achieve your desired goals. Protein and creatine shakes are very popular supplements that not only help you during your workout, but help you in post workout recovery. Consuming a protein shake pre and post workout will help with the repair of muscles and will make you feel fuller for longer. Consuming a creatine shake before your workout will assist in the regeneration of your ATP reservoir- allowing you to go longer and harder. Please remember, if you’re going to take creatine, make sure you’re well hydrated and consult a fitness expert on suggested dosage. If you have any question or you’re interested in gym supplements, visit Nutrients Direct Australia’s gym supplement experts. The last and final tip is to just have fun with it. Remember, you’re doing this for yourself and no one else. All good things come with hard work, determination and patience, so don’t be discouraged if you don’t meet your goals in the first few weeks. These tips are here to help you get started, the rest is up to you.